The Trinidad Ingenios Limited Edition 2007 is an aged creamy and medium-bodied Lonsdale, 6.5” (165mm) long, of 42 ring gauge, and comes a 12 cigars box. This is the first ever Limited Edition released by the Trinidad brand, and they are special because the binder, filler and wrapper have been aged 2 year. Being a limited edition, it is very rare to find, thus it is highly collectible. It is a very elegant cigar, with the classic Trinidad pigtail, or twist of a leaf, on the cap. There is the usual sweetness, also found in every cigar from the Trinidad lineup. There is also a lot of creaminess, flavors of wood, tobacco, earthiness and some strong floral notes. The strength starts in the mild range and ends up as a strong medium. The Trinidad Ingenios Limited Edition 2007 is a rare cigar to find. • Rather sweet cigar, with strong floral profile, and some darker notes. • Due to its aged tobacco, the flavors are creamier and more complex. This cigar is a unique aged cigar in the Trinidad line-up. The cigar is looking good despite its rather rustic look. The wrapper is rough, the veins are fairly small and the classic Trinidad pigtail at the head, gives it a nice overall appearance. 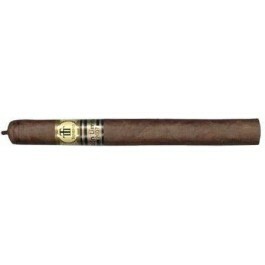 The wrapper is of deep brown color and comes with 2 bands, the usual Trinidad band and an "Edición Limitada 2007" band. The cigar feels firm in hand, and well packed from the head to the foot. The wrapper has an appealing tobacco aroma. Once clipped, the draw is a little bit tight. The cold draw gives some strong and clean flavors of wood and tobacco, with some hints of mint. Once lit, the burn line is good; the cigar requires one or two touch-up along the smoke. As every Trinidad cigars, the first third of the cigar is very sweet, with rich elements of honey. The dominant flavors are of wood, with some sweet floral aspect to it. The flavor profile is reminiscent of old tobacco, almost like tobacco used in a pipe, as there are some hints of aniseed. There are also notes of lychee and of earth. Overall, the strength in the first third is moderate, pretty powerful right from the beginning, at a medium body. In the middle third, the sweetness is still around, but at a lower level, as some darker flavors emerge alongside. There are aromas of leather, mineral, like granite, and some cocoa notes. There is some black pepper developing as well. The whole different flavors work very well together, the aftertaste is long and almost perfect. Meanwhile, the draw is still good and the strength is now a solid medium. In the final third, the sweetness dampens a bit more, while the earthiness becomes prominent, along with some charred sugar or charred marshmallow flavor. The spices also gain in strength in the last third: ginger, cinnamon and coriander. There are also notes of hazelnuts. Overall, the final of the cigar is slightly stronger than the first two thirds of the cigar, now sitting firmly in the medium range. In summary, this is a very enjoyable cigar that is both tasty but never overpowering.